Our April meeting will be held at the Orange County Regional History Center in downtown Orlando. We will have a guided tour through the facility. The exhibits include information about Florida’s First Peoples, the arrival of the Spanish, how 19th-century pioneers lived, and the importance of the cattle and citrus industries to the region. See the calendar for meeting details. Even the building that houses the museum is historic: the 1927 former Orange County Courthouse. 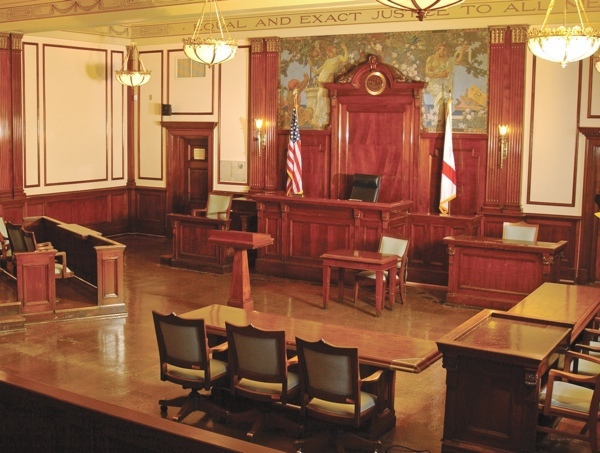 Much of the building has been restored to its original condition, including the original Courtroom B. Come prepared with any questions you may have about local history. Admission to the history center is $15 for adults. If we have more than 10 in our group, we may qualify for a discount. So bring your friends and family! Many of the exhibits are kid-friendly. For more information, see the Orange County Regional History Center website. Courtroom B at the Orange County Regional History Center. In the lower right corner of the defendant’s table in the foreground, you can see the cover placed to preserve the spot where Ted Bundy carved his name during his murder trial.